The north wind doth blow and we shall have snow … and wind and rain and hail and thunder and lightening. Yesterday, here where I live we’ve had the lot thrown at us. And that was just for starters! This morning, a light dusting of icing snow covers the rooftops and ground. The forecast this week is for more lousy winter weather to come. I hate the winter and the cold and wish I could escape it, just for the season, or better still, for good. Oh, what I’d give to be able to run away and hide away from it all. Given the opportunity (and the money) I would leave cold windy England and head to the sun. It’s a beautiful villa nestled right at the edge of the sea in Corfu, Greece. 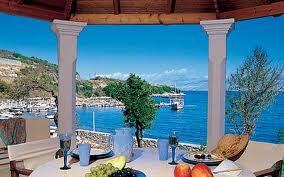 I love the Greek islands and all things Greek. Sadly, I have to wait eight months before I will be there again. Meanwhile, there’s not a lot I can do but curl up by the fire, open a bottle of champagne, and read a book. But not just any book! Today sees the launch of one I know is a cracker, and I’m not talking Christmas cracker here. 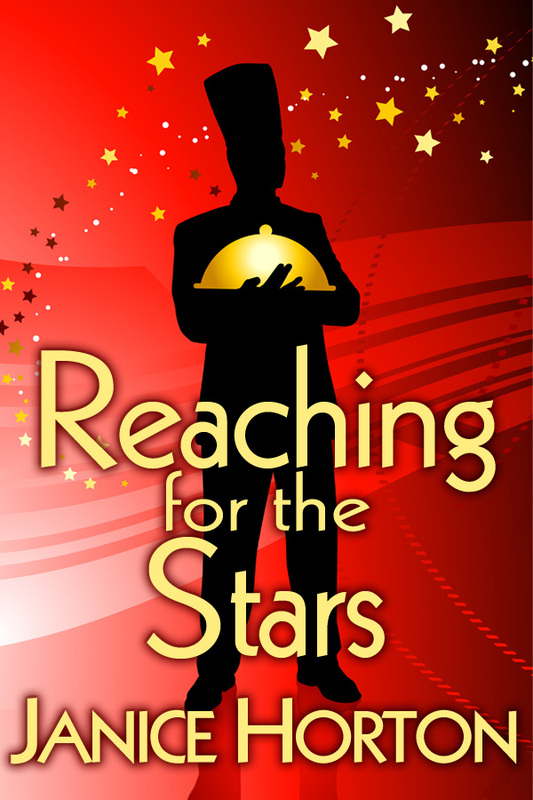 I’m talking about REACHING FOR THE STARS, the new novel by writer Janice Horton. A fun read concerning a celebrity chef determined to throw it all away for the love of a woman. I’ve been lucky in being able to read this book prelaunch, in its raw state, before the ingredients were well mixed, left to rise, stirred with many emotions and seasoned with the lovely humour Ms Horton writes so well into her novels. And now, the book having been baked to perfection, I can read it in its mature, lovingly crafted state. And there’s no need to wait for it to cool before opening that first page. So good luck, Janice Horton. This book deserves to take off with a bang and reach the zenith, if not in the stars, certainly in the book charts. ← To Italic or Not to Italic? Now that really does sound like a plan. Ha Ha! Always make room for one more. Just form an orderly queue! Thank you, Sheryl. Yes, Christmas always brightens a dull time of year. Sorry, all the suitcases are taken. Have a lovely festive season and thanks for dropping by. We have not got the snow in East Anglia but it is cold. Greece gets cold too in winter, but can’t be anywhere near as cold Blighty!Thanks for stopping by! Like Linn, I’ve got a pair of wool socks on. Was hit with a blast of cold air when I let the dog out this morning so a warm place like this is just the ticket. Even the pictures have warmed me up. So glad to have helped raise the temperature! At least we know spring and summer are on their way again, even if it doesn’t fell like it. Thanks, Eliza. Who says we shouldn’t go out in the sun? It’s wonderful. It’s natural and oh so wanted on days like today. Thanks, Kim. You’ll have to join a very long queue! Gorgeous, gorgeous photos, yes I can see why you picked that place. I wouldn’t mind going there myself. It will be well worth the wait by the look of it! Thank you, Rebecca. My heart is lost in Greece. If only I could persuade my husband to come too, I know he would enjoy it but he’s a home bird. Enjoy your day and hope you have a dream place to look forward to, too. What a gorgeous view, it’s like a postcard.Now I want to go on holiday. Thank you, Anne. I keep the view on my desktop. Keeps me going through the winter, knowing each day is one day closer to being there. Now that’s a thought! I’m here with my cosy winter socks on…. and now you’ve made me a couple of degrees warmer! Ha! Ha! A relaxologist taught me to feel warm on a cold day, think of somewhere nice and hot you’d rather be; and if you are too hot, think of floating on ice. It works!